고달사터에 남아 있는 높이 4.3m의 고려시대의 승탑이다. 고달사는 통일신라시대 경덕왕 23년(764)에 창건된 절로, 고려 광종 이후에는 왕들의 보호를 받아 큰 사찰로서의 면모를 유지하기도 하였으나, 조선시대에 폐사된 것으로 추정된다. 이 탑은 바닥의 형태가 8각을 이루고 있으며, 꼭대기의 머리장식이 완전하지 않은 것을 제외하면 대부분 잘 남아있다. 전체의 무게를 지탱하고 있는 기단(基壇)은 상·중·하대 세 부분으로 구성되어 있다. 하대의 각 면에는 내부에 꽃 형태의 무늬가 있는 안상(眼象)이 2구씩 새겨져 있고 윗면에는 16엽의 연판이 돌려졌다. 중대는 이 승탑에서 가장 조각수법이 뛰어난 부재로써 거의 원형을 이루고 있으며, 정면을 바라보고 있는 용과 같은 얼굴의 거북은 입체적으로 표현되어 사실감이 느껴진다. 가운데 거북을 중심으로 총 네 마리의 용이 보주를 쥐고 있으며, 나머지 공간은 구름무늬를 가득 채웠다. 상대석에는 큼지막한 8엽의 앙련이 조각되어 탑몸돌을 받치고 있다. 탑몸돌에는 문비와 자물쇠, 사천왕상(四天王像), 광창(光窓)이 표현되어 있다. 몸돌을 덮고 있는 지붕돌은 꽤 두꺼운 편으로 아랫면에 비천과 구름을 표현하였다. 지붕돌 윗면 각 모서리를 따라 아래로 미끄러지면 그 끝마다 큼직한 귀꽃이 달려 있는데, 일부는 파손된 상태이다. 상륜부에는 둥글넓적한 복발 위로 보개(寶蓋)와 보주(寶珠)가 올려져있다. 전체적으로 통일신라 승탑의 기본형인 팔각원당형 구조를 잘 따르면서도 조각의 세부수법에서는 고려 특유의 양식을 보이고 있어 고려시대 전기에 세워졌을 것으로 보인다. 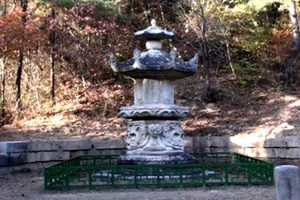 This stupa of the Goryeo Period (918~1392) had originally been located at the precincts of Godalsa, a Buddhist temple established in 764 when Unified Silla was under the rule of King Gyeongdeok. 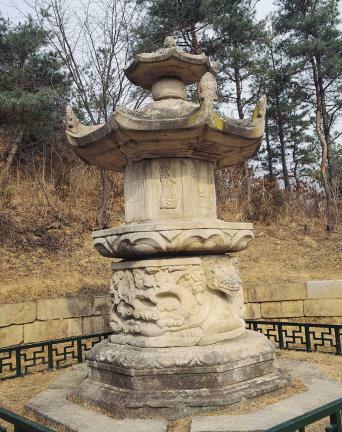 The temple enjoyed great prosperity during the early Goryeo since it was protected by its rulers after King Gwangjong (925-975), eventually disappearing although no record remains to inform us when. 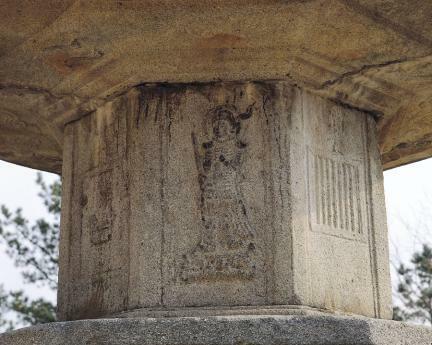 The stupa, marked by an octagonal base, has preserved its original condition comparatively well although the finial lacks perfection. 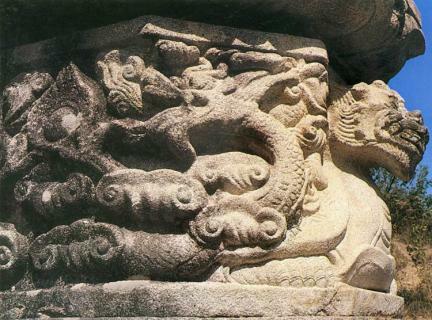 The base consists of three tiers whose middle tier is adorned with an impressive array of elaborate carvings. 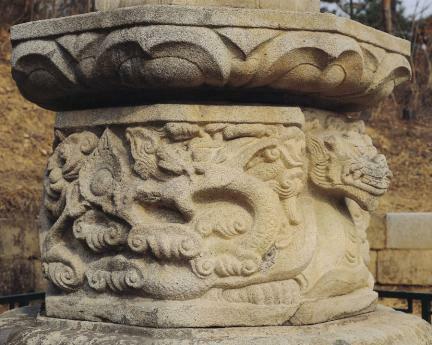 It is more circular than octagonal, with the surface carved with two tortoises and four dragons surrounded by auspicious clouds all expressed in a realistic manner. 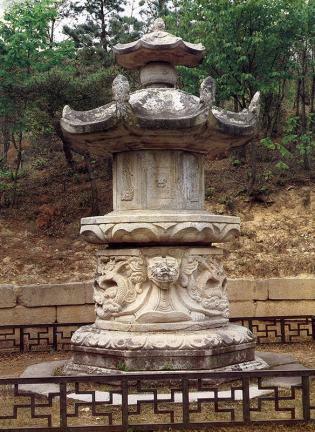 All the carvings of the middle tier exhibit fine artistic skills and overflowing energy, whereas those around the upper and lower tiers feature elegant lotus designs. 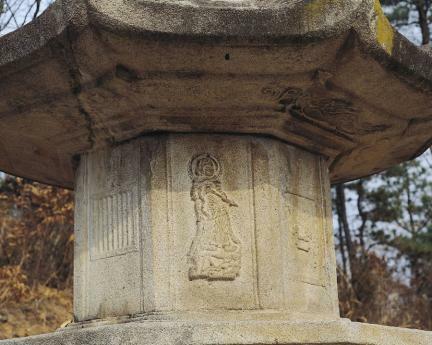 The main body of the stupa where the Artifact of an eminent monk are enshrined is carved with the Four Heavenly Kings and a pair of doors closed with a padlock. 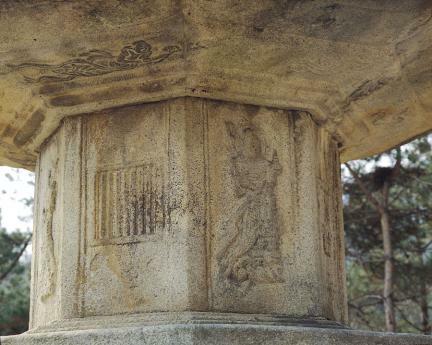 The carving of the doors is rather plain and much stylized, whereas the roofstone is significantly thick with large -- but coarsely carved -- floral decorations on each corner. 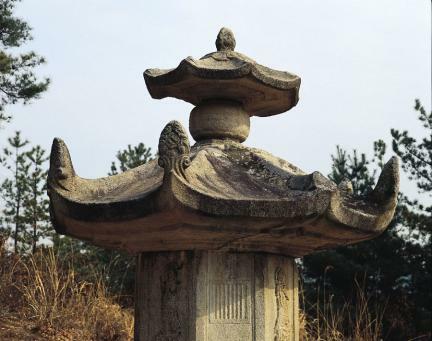 Above the roofstone is a bejeweled canopy (bogae) in the shape of a roof supported by a spherical stone. 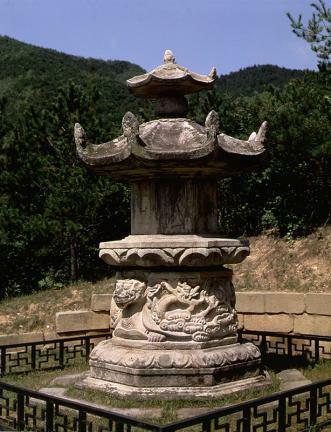 The style of this stone stupa is characterized by the use of unique carving techniques developed by Goryeo artisans probably during the 10th century, with its basic elements clearly reflecting the principles formed during the Unified Silla period. 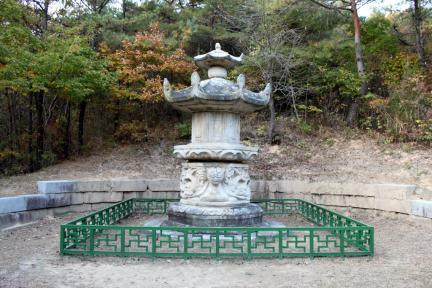 The carving techniques and the artistic details of the carved decorations clearly show that it is a work produced by one or more master artisans of Goryeo.